As July is ending and we creep into August, we’ll be hitting the hottest point of the Summer. If you’re in an area off a lake or ocean it’s not that bad, but it can be almost unbearable here in the center of Florida. I’m always looking for new ways to cool off, and if I can mix in some booze too it’s like hitting the lottery. I saw this recipe for some boozy adult popsicles and I just HAD to make them. I only describe a handful of things as “crack”: 4Rivers Smokehouse BBQ, Harolds Fried Chicken, a frozen irish coffee from Erin Rose Bar , and now these. If you haven’t tried Veev before, consider this your gateway drug into drinking it. It’s an Acai flavored liqueur that previously was 60 proof but was recently reformulated to 70 proof to give it a little more kick and compete with flavored vodkas. We sampled the new and improved Veev at Tales of the Cocktail and it’s a winner. If you’re into the weekend DIY projects, this one takes half the time, and is twice as worth it when you’re done. Blend all ingredients together. 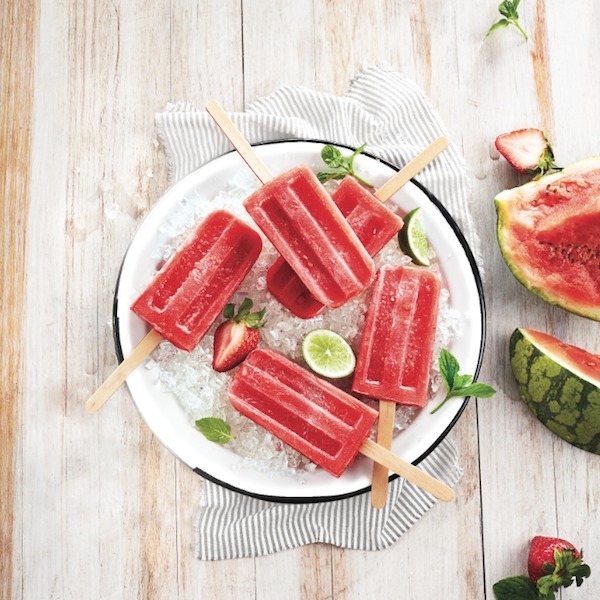 Pour into popsicle molds of choice and freeze overnight. If you don’t have popsicle molds use mini dixie cups! Pour liquid into the dixie cups & insert your popsicle stick. Freeze overnight then peel the dixie cups off.